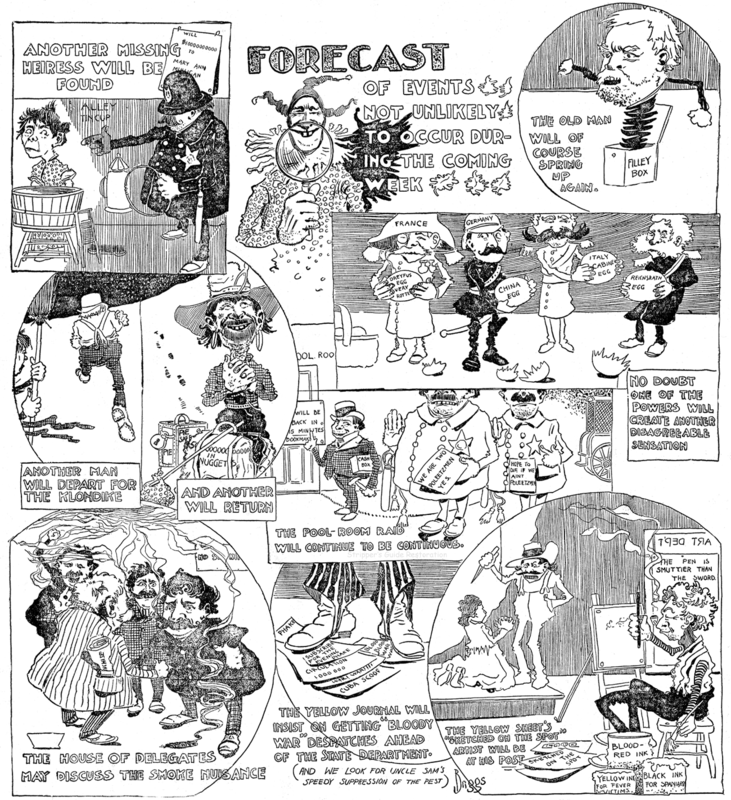 Tuesday, September 8 1908 -- Cartoon in observation of Labor Day. Awfully sporting of the Captain to thank Connie, rather than telling her that she put him in much greater danger by shooting the shark. She chummed the water with blood and no doubt attracted all that shark's kin from the surrounding waters in a blood-induced feeding frenzy. Connie, June 27 1937, courtesy of Cole Johnson. From Clare Briggs' first year as a newspaper cartoonist, here is a huge 2/3 page cartoon from the December 12 1897 edition of the St. Louis Globe-Democrat. The most popular couple In America this week are celebrating their fourth anniversary. Four years ago, on April 10 1904, Mr. and Mrs. Newlywed appeared for the first time in pictures in the Funny Side of the Sunday World. The pictures of the Newlyweds, drawn by George McManus, instantly became popular. A little more than a year and a half ago the interest taken in the Newlyweds was further enhanced by the first appearance of the baby in the pictures. Those who had merely smiled at the Newlyweds laughed at the Newlyweds and their baby. Though just plain Americans of moderate income the Newlyweds and their baby have become known all over the world. They have been received at two foreign courts, and in this country have been welcomed by governors, senators, millionaires —everyone. Victoria, queen of Spain, directed her little son's governess to write to Mr. McManus a tribute to the humor of the Newlyweds, and the crown prince of Germany had the Count Bismarck von Bohlenn write a similar letter in praise of the Newlyweds. It is the realness of life in the pictures of the Newlyweds and their baby that makes the public take them in all seriousness. Scarcely a day has passed since the first appearance of the Newlyweds that the mail has not brought a score or more of letters to Mr. McManus giving advice and asking questions about the characters he was drawing. The announcement made several months ago that the Newlyweds baby would be named after the best suggestion offered by the public brought thousands of replies. For nearly a month hundreds of letters came each day suggesting a name for the baby. A similar interest was shown at the approach of the baby's second tooth. The responses to the requests for a name and the best position for the second tooth came to Mr. McManus from all parts of the United States and from many other countries. They came in German French, Italian, Spanish — in fact, in almost every modern tongue. The genuineness of the interest taken by the public in the Newlyweds and their baby is no better illustrated than by the letters received by Mr. McManus referring to the baby's tooth. A considerable number came from reputable dentists who in a friendly way chaffed Mr. McManus for not knowing that a baby's first teeth appeared in pairs and first of all in the lower jaw. That the followers of the Newlyweds are consistent in their interest has been shown during the past few months by the letters that have reached Mr. McManus referring to the failure of the baby to grow up. After the first year of the baby's appearance scarcely a day passed without letters being received insisting that it was time the baby began to show signs of his increasing age. The remarkable coiffure affected by Mrs. Newlywed immediately interested everyone. The ability of a woman to do her hair in such style was doubted by many; and McManus was taken to task in scores of letters by women who evidently had tried and failed. The doubters were silenced, however, when Miss Florence Bergere, who took the part of Mrs. Newlywed in a dramatization of "Panhandle Pete," appeared with her hair dressed in exactly the style drawn by Mr. McManus. At the same time this style of dressing the hair became so popular that women with sparse locks rushed to the wig makers to buy pads to fill out. The vast number of letters that he receives daily make it impossible for Mr. McManus to reply to all who write him. He answers as many as he can, however, especially those whose sincerity is particularly appealing. Two letters he received a short time ago are but samples of many that have come to him. One was from St. Louis and came from a woman who believed herself to be dying. Despite an incurable illness which confined her to her bed, she wrote her appreciation of the Newlyweds, declaring they made the time pass quickly. The other letter came in advance of a cane made entirely from the comic sections of the Sunday World in a penitentiary in Arizona. The prisoner, a man sentenced for a long term, wrote of the interest he and his fellow convicts took in the Newlywed pictures. The approach of the fourth anniversary of the appearance of the Newlyweds has brought an increased number of letters to Mr. McManus, showing that many people have followed the fortunes of the couple throughout their existence. A large number of the letters contained suggestions for a suitable celebration of the appearance of the Newlyweds, and especially urged the adoption of some one day as the baby's birthday. That the interest taken in the Newlyweds is friendly in the extreme is shown by the countless suggestions received by Mr. McManus of new feats for the baby to accomplish. Newspaper clippings from all over the country containing references to unusual performances of young babies are enclosed in letters almost daily. Mr. McManus himself is obliged to do much explaining among his friends and acquaintances who see in the troubles and joys of the Newlyweds a fancied reference to a real experience in their own homes. Mrs. Newlywed, endowed by Mr. McManus with rare beauty, had a host of admirers from the start, but Mr. Newlywed has been forced to fight his way under the handicap of his looks. That his rare good nature and extreme devotion to his wife and baby have been recognized, the correspondence of Mr. McManus proves. The letters which at first referred only to the sweetness and beauty of Mrs. Newlywed and the homeliness of Mr. Newlywed have gradually changed in tone, until now Mr. Newlywed's good, qualities receive as much attention as do those of his wife. "'Tis only a few years ago that, without ever having had a drawing lesson, he went into the artists' room of the Republic. He did hackwork, but he did it well, and tried for better work. He tried a cartoon or two; his work told; he designed some posters in which he aimed at something like beauty and hit the mark. His work asserted itself, but it brought no adequate pay. So he hiked to New York, and in, as we say, no time, he was one of the stars of the comic section of the World. First he invented Panhandle Pete a cadging tramp. Pete was spread over the country by the supplement syndicate plan, and he became a national character. "But Panhandle Pete's success was nothing to that of the Newlyweds and their baby, Napoleon. These persons are the delight of millions. And in the picturing of their troubles there's a fine display of cleanly humorous fancy. The coarseness of much comic supplement stuff is absent. The drawings make the woman beautiful — relatively — the husband a blandly blithering idiot, the baby an incalculable, destructive bawl. "Father and baby are burlesque, but mamma is pretty and trim, though ‘just crazy about the baby.' All this goes right home to the man-in-the-street, or the man-in-the-flat, the clerk, the working man. And the women—they eat it up. The baby, ugly brat though he be, is a dear. The incidents are the commonplaces of middle class family life, not so funny as they are universal, illustrating nothing except that the baby is boss of the ranch, and that his parents think him the greatest baby that ever happened and worth all the troubles he makes. The millions look for the Newlyweds, and finding them, roar. fellow, hard working, ambitious for better things, self-sacrificing for his family and — as bohemia sees him — about equally pathetic and absurd, in his bourgeois ideals. that McManus, wittingly or unwittingly, is a satirist who sears in spots even as did Hogarth or Cruikshank. He's a cynic even though he play upon the heart interest, the mother instinct, the home ideal — all dear to the average person. He smashes hard at paidolatry and the wallowings of parenthood. Treve was the nickname used by Trevalla Henry Collins Junior, who was born in San Francisco, California, on March 26, 1892. His full name is based on his father’s name in the 1892 San Francisco voter’s register at Ancestry.com The birth date is from Collins’ World War I draft card. At some point Collins moved to Brooklyn, New York. The Brooklyn Daily Eagle, August 10, 1896, reported the new clubs that had incorporated in Albany, New York. Collins’ father was a trustee in the Bull Players’ association. Collins has not yet been found in the 1900 U.S. Federal Census. The 1905 New York State Census recorded Collins in Brooklyn at 25 Bartlett Street. According to the Eagle, February, 3, 1907, Collins graduated from Public School 36. Additional information about his education has not been found. Sixteen-year-old Collins participated in the Eagle puzzle contests and was listed in the September 16, 1908, “Lucky Puzzle Solvers” column. The 1910 census recorded Collins and his parents in Brooklyn at 646 Marcy Avenue. His father was a bookkeeper at a shoe manufacturer, and Collins was a stenographer at a tin ware manufacturer. Collins was at the same address in the 1915 New York State Census. 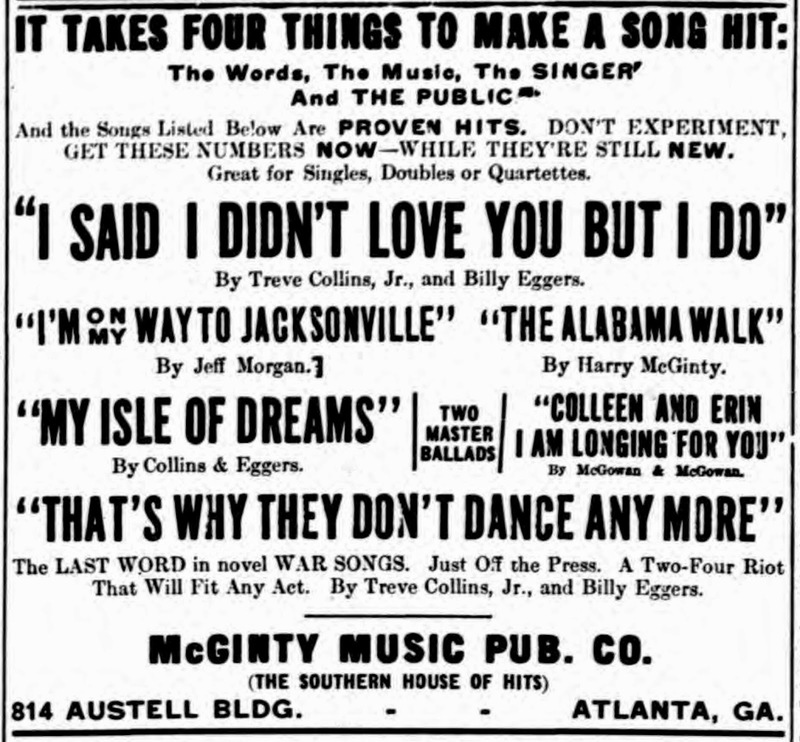 Songwriting was one of Collins’ talents. In 1912 several of his songs were copyrighted including Harmony Glide, My Ragtime Maid, and That Fanciful Strain. Treve Collins, Jr., the young Brooklyn lyric writer, has no complaint to make with the way 1916 has shaped up up for him thus far. The placing of the first Collins-Bellin number, The song Down in Your Heart, was recently announced. Now comes the announcement that Betty Bellin has also written the melody of another of Treve’s lyrics, entitled, I Miss You, Mississippi. Ernie Burnett, Buch and Lowney’s star composer, has contributed the melodies for the following Collins lyrics: Sailing Home, Where the Chapel Chimes Are Ringing on the Ray of Old Biscay, and Since Mary Jane Got Back to My Home Town. Brooklyn, N.Y., July 1—Bathers at Coney Island and other beaches near New York were surprised the other day by the sudden appearance in the water of hundreds of small, sealed boxes, which, when opened, revealed regulation wireless telegraph blanks, on which were typed, “Greetings from the Good Ship Melody, en route to the offices of the Will Carroll Company, Inc., 122 Flatbush avenue, Brooklyn, with a cargo of new song hits.” The boxes bad been thrown out from a motor boat at some distance from shore. The stunt is considered one of the cleverest bits of publicity work yet originated by a music publishing company. Treve Collins, Jr., staff lyric writer and publicity manager for the firm, is responsible for the idea…. Collins also sang and belong to the Men’s Club of the Puritan Congregational Church. The Eagle, April 26, 1913, reported the group’s annual minstrel show at the church. The June 1916 Brooklyn Bulletin, published by the National Electric Light Association, Brooklyn Company Section, said Collins had worked at the Eagle. …A feature of the afternoon was the newspaper experiences of Treve Collins while on the staff of the Brooklyn Eagle as related by himself. They were not only interesting but very humorous. There is one consolation about crowded street cars: You may be too tired to stand up, but you couldn’t fall down if you wanted to. Time and tide wait for no man. So woman, lovely woman, continues to be as late as she pleases. Some women can see good points in every man except the one they’ve married. The only reason some men long for sudden wealth is that it would enable them to lie in bed as long as they’d like to in the morning. A woman is quite will to forgive a man all his faults—unless she’s married to him. 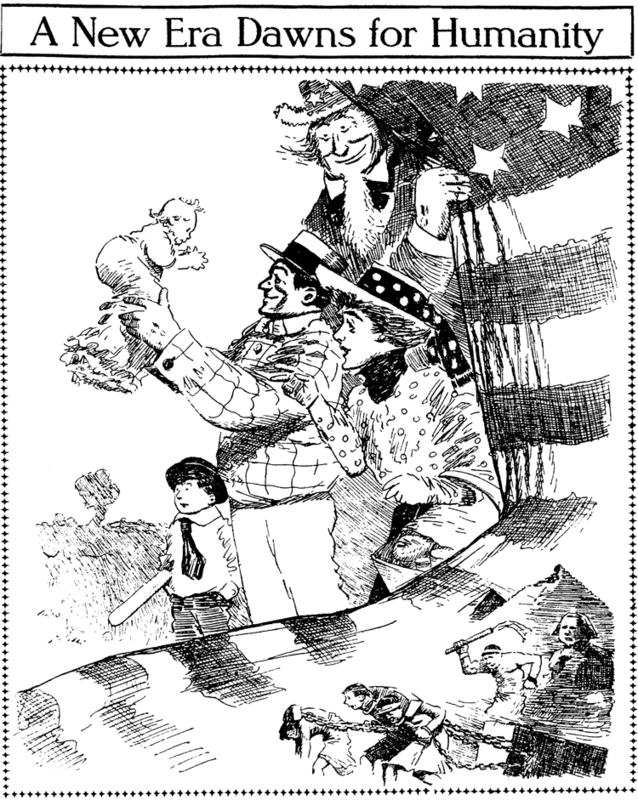 Collins was included in the book, Our American Humorists (1922). At some point Collins added cartooning to his portfolio. Information about his cartooning training has not been found. The Daily Standard Union (Brooklyn, New York), January 14, 1913, reported the meeting of the Brooklyn Company Section, National Electric Light Association at the Academy of Music. 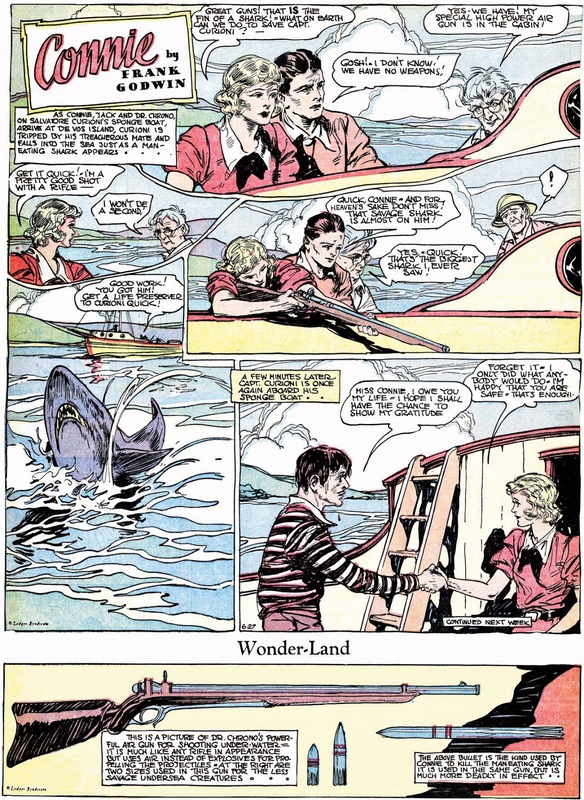 Collins produced the strip Past and Present which appeared in March 1919. Collins signed his World War I draft card on September 5, 1917. The name on the card was “Treve H. Collins Jr.” His occupation was “Secretary to Purchasing Agent; Edison & Co., 360 Pearl Street, Brooklyn.” He was described as short and slender with brown eyes and hair. Collins’ occupation was private secretary at an electrical house as recorded in the 1920 census. He continued to reside with his parents whose address was in Brooklyn at 6 St. Francis Place. The Silent Film Necrology (2001) said the August 14, 1920 issue of Moving Picture World published the article, “Treve Collins Writing Two-Reelers for Legend”. Collins’ name appeared in the Legend Film Productions advertisements in Wid’s Year Book 1920–1921 here and here. Collins, Treve Jr.; early career, newspaper man and short story writer, contributed humorous prose, verse and drawings to publications throughout the country; screen career, author of a number of special two reel comedies produced by Legend Film Prod., featuring John junior and Edna Shipman. Now writing independent special comedy dramas and dramas. Free lance writer of originals, titles and continuities. Member Brooklyn Press Club. Home ad., 6 St. Francis Place, Brooklyn, N. Y.
Collins contributed to The Plumbers Trade Journal from the early 1920s to 1939. His roles included freelance writer and cartoonist, editor and advertising manager. 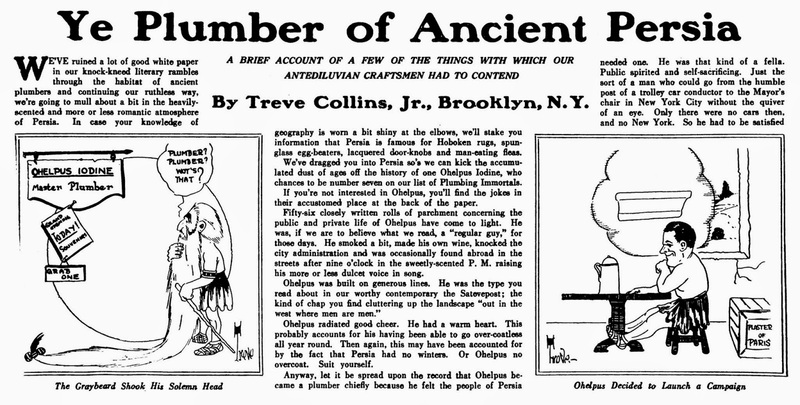 The August 15, 1922 issue published his story “Ye Plumber of Ancient Rome”. 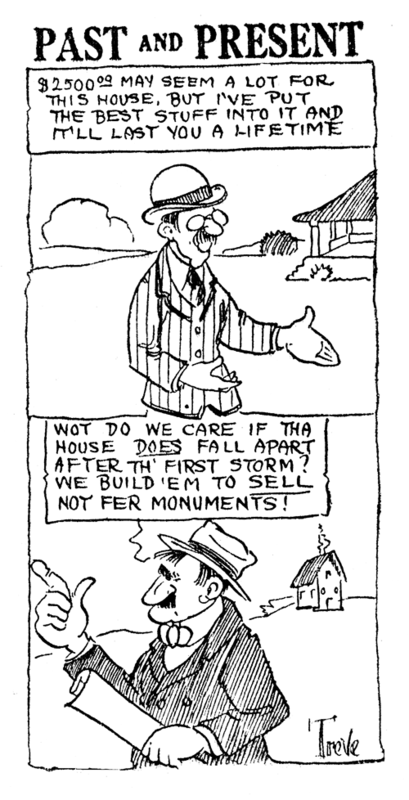 The December 15, 1922 issue had Collins’ two illustrations for “The Deferred Payment Plan”. 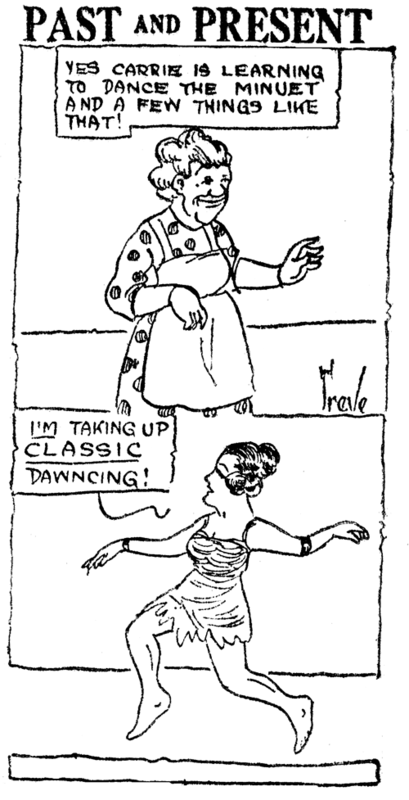 The Eagle, September 9, 1923, noted the engagement of Miss Knapp to Collins. Announcement has been made of the engagement of Miss Theodora Knapp of Rosevllle, N. J., to Treve Collins Jr. Mr. Collins is the son of Mrs. Mathilda Collins of 264 Linden Ave., Flatbush. They did not marry. According to the 1930 census, Collins was single and editor of a trade journal. He and his mother resided in Montclair, New Jersey at 26 Forest Street. 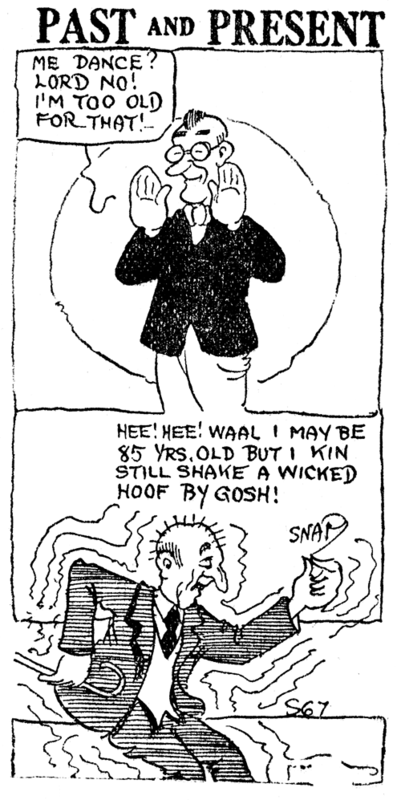 Collins has been credited with a daily panel called It Does Happen which was distributed by Thompson Service from 1931 to 1934. Collins’ novel, Stairway to the Stars, was published in 1936. Palisades Park, N. J., July 8—Funeral services will be held tomorrow at 8 p.m. for Treve H. Collins, 46 [sic], of 40 E. Columbia Ave., here, advertising manager of the Plumbing and Heating Journal in Manhattan and a writer of note, who died yesterday, in Holy Name Hospital, Teaneck, N. J., of complications resulting from a ruptured appendix. The services will be conducted at the Blackley Funeral Home, 809 Broad Ave., Ridgefield, N. J.
Mr. Collins formerly lived in Brooklyn and at one time worked as a reporter on the Brooklyn Eagle. He first became associated with the Plumbing and Heating Journal about 22 years ago as a free lance writer and artist. About 1923, he was made editor of that Publication, and about nine years ago, became advertising manager. In the early days of motion pictures, Mr. Collins wrote scenarios. On one occasion he played a part in a picture he had written. He was unmarried and left no immediate survivors. Past and Present seems to have been originally intended as a daily panel, but World Color Printing was notorious for not being able to sell daily features. That didn't stop them from trying though. 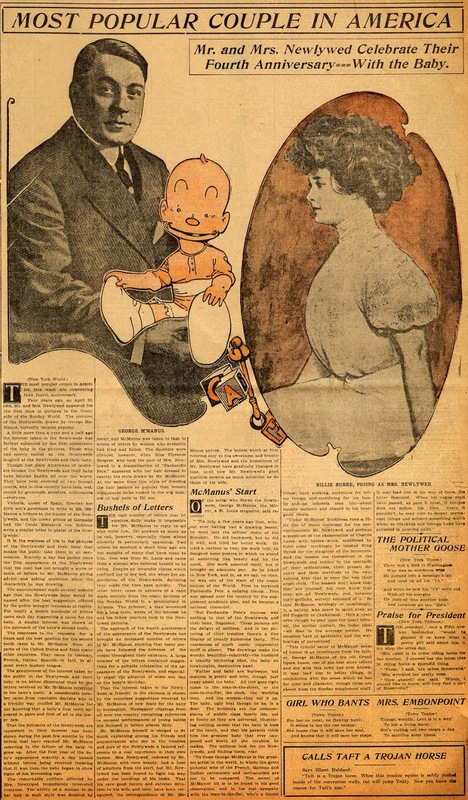 This feature seems to have debuted on March 17 1919 (if the Wichita Beacon used it from the start), initially drawn by a capable but anonymous cartoonist. Less than two weeks later, though, it was taken over by 'Treve', who was pretty bad (all examples above are by Treve, I believe, though some are unsigned). World Color added Past and Present as a filler on their weekly black-and-white page in April 1919, the repository for all their hapless dailies. The feature was then numbered, and you can see numbers as high as S67 in the samples above. The feature appeared on the black-and-white page at least until mid-1920, but then seems to have been dropped. This is unusual for World Color Printing, as they generally would recycle these things practically ad infinitum. 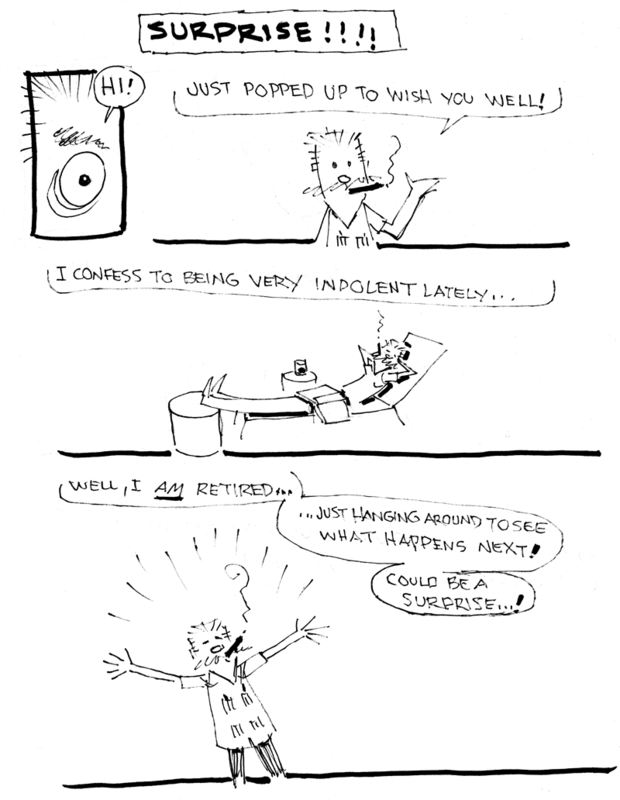 Perhaps the WCP folks were a little embarrassed by Treve's cartooning abilities. Also unlike most of the WCP dailies, I haven't found Past and Present popping up in later years from those bottom of the barrel reprint-selling outfits. I guess Past and Present crossed some line in the sand of quality control, though that is hard to believe given some of the awful features that shambled, zombie-like, through the pages of rural weeklies in the 1930s and beyond. Believe it or not, Alex Jay has unearthed the identity of 'Treve', see tomorrow's Ink-Slinger Profile. I need to get Jim's address and phone number! Please e-mail me at czablo@cfl.rr.com. I'd like to visit him over Christmas break.